Welcome to the Master’s column. 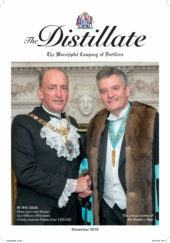 This is a new initiative as, so far as I know, there has not been an online column since Past Master David Sill’s erudite and entertaining musings from the Master’s chair some years ago. There is so much that the Masters sees and hears that I thought that it might be of interest to the Livery as a whole. The Mistress and I (Sarah and Richard) are after all ambassadors for the Livery Company and are out there regularly taking part in City and Livery events and you should know what we are up to on your behalf! I mentioned at my installation that I first came to live in London as a student at the City of London Business School in 1967 and although I was surviving, just, on £10 a week all up I did manage to get to see some of the magic of the City. It is tempting to say that it has all changed, and physically it has of course with the Gherkin, the Cheese Grater and all the other towering buildings, but in so many other ways it is still the same – with all the little courts and alley ways which repay a wander down to see where they go – often of course to a hidden Livery Hall. Try the Merchant Taylors – you would never know it was there but inside, just near the Bank of England is one of the most beautiful mediaeval libraries, quadrangles and gardens in the City – perhaps the country. I often find myself walking around the City searching for morning coffee after a night out, and have found that some of the best cafes are in the old Wren Churches. On a guided tour of them and I was amazed to found that some 22 churches were re-built in the years after the Fire in 1666. Wren set up a major architectural practice and created five basic designs to which could be added different towers and adornments according to taste. For the architecture you must visit St Stephen’s, Walbrook; you will have walked past it a dozen times and not given it a second glance on the way to the Mansion House, as it is right next-door. Inside is what is said to be one of the most perfect structures in the country and perhaps well beyond that. It is modern inside – quite controversially after the Peter Palumbo redesign – but well worth a few minutes. He also broke all the rules by building No 1 Poultry in pink sandstone and the building has an unfortunate second reputation for sudden ends to careers that having gone bust. I won’t elaborate. The Installation is quite a moment for the incoming team and nothing quite prepares you for the whole of the room rising to its feet and toasting the poor chap sitting in the big blue chair trying to think of something intelligent to say. But it certainly feels like a momentous occasion and I really appreciated the turnout of over 108 Liverymen; they got to hear quite a lot of my early life from my friend Sean Roberts – not for repetition here. The year usually starts quite slowly apparently, but not mine. Within a few days I was sitting at the top table of the Maltmen of Glasgow dining in the magnificent surroundings of the Merchants’ Hall catching up with Past Master Cooper Keith Brown and Deacon Convenor George Thompson both well known in Scottish drinks circles and to our Livery. Scotland is very important for our Livery as it is here that most distilling takes place in the UK – including Gin – not just Whisky. The St Cecilia Day’s Service in Westminster Abbey was the next port of call. From my early days in the chapel choir at Bedford School I have enjoyed early English church music and this was a festival of that, par excellence. The event is a fundraiser to help musicians who get into difficulties – and I remember Richard Stilgoe, in his address in a previous year asking us to imagine a life without music and musicians – we take them so much for granted. I met up with my old friend Christopher Lawrence who should be Master Musician in about four years, reminding me of my early musical days again at Bedford and ruing the day I stopped playing my violin – who knows it might come out again. I well remember the days at his beautiful home sitting in on impromptu concerts by John Dankworth and Cleo Laine as they started the Wavendon All-Music centre. JD drove a magnificent Aston Martin DB4 which apparently broke the speed limit to the sound of middle G according to evidence to magistrates – yet another story for the car club! Dinners with other Liveries are brilliant ways of finding out about other industries and ways of life. The Information Technologists provided a very early invitation, shortly to be followed by the Cutlers who were celebrating the 600th anniversary of their Royal Charter. They were the only Livery to receive a charter from Henry Vth, in grateful thanks for their support at Agincourt. The assembled Masters and Clerks celebrated this in the nave of St Bartholomew The Great which must be one of the oldest Romanesque churches in London. Incense was in the air and the service in Latin Gregorian chants was very special and moving. Later at the Old Bailey (it’s important to go in through the front door) I met the Master of the Guild of Air Pilots, and he was fascinating in describing the international scope of their work, and the way that they advise today’s industry on critical issues of safety and training – perhaps an object lesson to us as they really are at the hub of their industry. The Glass Sellers invited me to their Master’s installation dinner in the magnificent surroundings of the Stationers Hall. They are of course part of the informal Cask group of Distillers, Vintners, Brewers, Coopers and Innholders and have some nice traditions such as the gift of an engraved glass from the outgoing to the incoming master, and are certainly close to their industry. A weekend in December in Chester with the Mistress at the Brigantes gathering of northern Liverymen started the Christmas Season in the best possible way in the Cathedral there. We had never been before to this lovely and compact City and what a treat it was. The music, surroundings, supper and convivial company brought together so much of what makes Livery life so special. The Brigantes events are, incidentally, open to all Liverymen and there is a lunch coming up in July. Then it was time for our own Carol Service. After weeks of searches for locations with the Assistant Clerk, surprise, surprise, we discovered the best one on our doorstep in the Guildhall Club. Hours of listening to various carols on Spotify (what a miracle that is !) finally produced an order of service and off we went. For those of you who attended I hope you will agree that we have cracked this as an event now. A glass of champagne, the church service with nearly 90 in the congregation followed by a very good three course festive dinner really does it well – and I hope that we can continue this in the future with many more finding that it is worth coming to the city even in the middle of the bustle of Christmas to celebrate what it is all about in the best possible way. Thanks be to God for food and wine. January traditionally starts slowly which is something of a relief after the Christmas break. For me the year kicked off with a meeting to review the work being carried our by Liveryman Malcolm Davis on our early history and the role of alcohol when we were founded. We want to understand much better how we left the Apothecaries in the mid1600s as beverage alcohol became established. Fascinating work and it will continue when we go to Schiedam in June for our Distillery visit and learn how the Dutch were getting on with Jenever at this time. I learn that doctors were called Quacks from the beaks on their capes packed with a perfumed spirit and worn to escape exposure to the Plague. We have moved on a bit since then. Traditionally the Benevolent Wine Trade Charity Lunch in January is the moment to hear how the Christmas trade has fared – and to hear about the work of this great charity. The Vintners are very generous and the wines were as always, superb. Back to the Vintners Hall with the Mistress and Clerk to try out the menu and wine proposals for the February Livery lunch which takes place on the 16th. Difficult work but someone has to do it. I hope you like it – we have chewed over the decisions carefully. The Consorts own lunch hosted by the Mistress at the Innholders takes place at the same time, with a speaker and a different menu.